Donald Trump has decided to play both sides, er, late-night hosts. Trump, whose Friday booking on The Tonight Show Starring Jimmy Fallon was one of Fallon's biggest counterprogramming coups during The Late Show with Stephen Colbert's first week, is also going to be visiting the new host on the block. Other notable Week 3 Late Show bookings include Hugh Evans, founder of the Global Poverty Project (Sept. 23), the Archbishop of Miami, Thomas Wenski (Sept. 24), and Nobel Prize laureate Malala Yousafzai (Sept. 25). Yes, there will be celebs, too: Kerry Washington stops by on Sept. 25, and Hugh Jackman visits on Sept. 23. But Trump is the clear standout of the bunch. How badly did Colbert want to land him as a guest? Last month, Colbert said his biggest wish was for Trump to still be in the presidential race when his show launched. 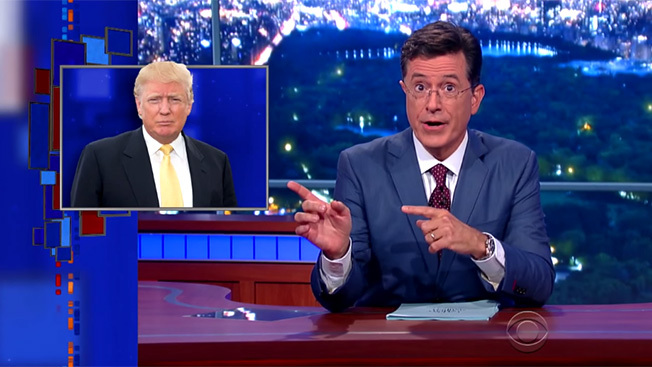 "I want to do jokes on Donald Trump so badly, and I have no venue," Colbert said. "Right now, I'm just dry-Trumping. Every night before I go to bed, I light a candle and pray that he stays in the race. I also pray that no one puts that candle near his hair." During his impressive Late Show premiere, Colbert did a lengthy bit about Oreos, comparing them to Donald Trump jokes and his inability to make (and eat) just one. By the end of the segment, Colbert was stuffing his face with them. The Late Show's Trump news comes as the Tonight Show reclaimed the late-night ratings crown on Colbert's second night. Fallon's 1.2 rating among adults ages 18 to 49 nearly equaled the combined ratings of Late Show (0.8) and Jimmy Kimmel Live (0.5). Not to be outdone, Fallon has landed some political hotshots of his own: In addition to Trump on Friday, he'll welcome Hillary Clinton on Sept. 16.